The burned-out girls’ high school in Logar Province, Afghanistan, that was attacked on April 11. The school is in the home district of President Ashraf Ghani, about 35 miles from Kabul. MAZAR-I-SHARIF, Afghanistan — Four attacks across Afghanistan on Saturday night and Sunday killed at least 26 government security officers, while two schools were also set ablaze, according to Afghan officials. The four attacks struck government outposts in northern and eastern Afghanistan; at least three appeared coordinated. They occurred late at night or early in the morning, with the attackers using long-range sniper rifles and night-vision equipment, according to Afghan officials, who tallied at least 10 wounded in all, along with those killed. In separate assaults, a girls’ high school in Logar Province, near the capital, Kabul, was burned on April 11, and masked attackers struck a school in the village of Momandara, in Nangarhar Province, on Saturday night, setting archives and labs ablaze, according to education officials. No one was reported hurt in those two attacks. There was no immediate claim of responsibility, but government officials blamed Taliban insurgents for the attacks on the government outposts. In recent years, mainstream Taliban forces have normally refrained from attacking schools. In the Sancharak District, in the northern Sar-i-Pul Province, which has teetered between government and Taliban control over the past year, the governor, Naqibullah Daqiq, said that two government checkpoints in the west had been attacked by Taliban fighters using night-vision equipment and sniper rifles, with one guard killed at first. When local pro-government militiamen tried to counter the assault, they fell into a Taliban ambush, and 10 others were killed, Mr. Daqiq said. Nematullah Tofan, the police chief of the district of Dawlat Abad, in another northern province, Faryab, said that two government checkpoints in the village of Khairabad had fallen to Taliban fighters after their snipers killed four government defenders, shooting each of them in the head. Attacks by insurgents using sophisticated night-vision technology have risen in the past year, especially against police and militia units that do not have such equipment. Afghan officials have asked for the gear to be issued to their police officers, but American officials have been reluctant to do so for fear that it would fall into Taliban hands. The third attack was in Ghazni Province, in southeastern Afghanistan, where two Afghan Local Police checkpoints in the district of Jaghatu were attacked at 2 a.m. Sunday, killing eight officers and wounding four others, according to Hamidullah Nawruz, a member of the Ghazni provincial council. Afghan Local Police officers are militiamen defending their own communities; they are generally less trained and not as well equipped as the national police. A fourth attack took place on Sunday afternoon, when three guards outside Nangarhar University in the eastern city of Jalalabad took a break for worship. Gunmen on a motorcycle opened fire on them while they were praying, killing two immediately, according to a news release from the provincial governor’s office. The third guard fled but was chased by the gunmen and killed as well, according to a witness who insisted on anonymity for fear of reprisals. 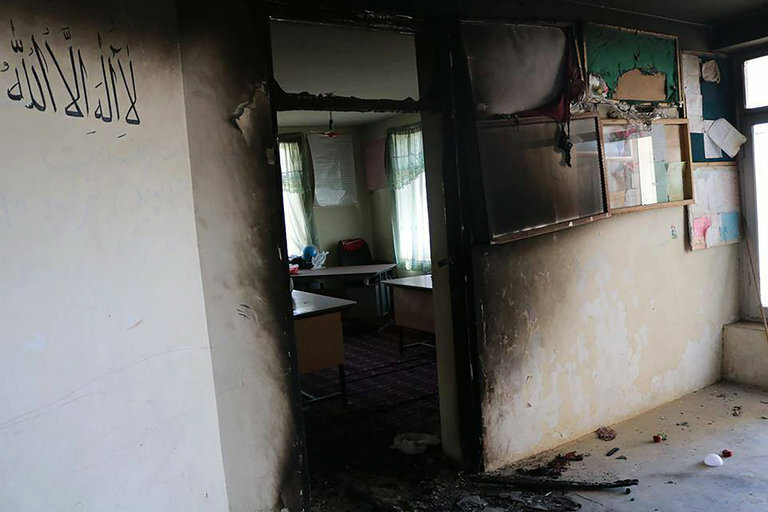 The girls’ high school in Logar Province, in a village in Mohammad Agha District, was attacked on April 11 by gunmen who beat up the night watchmen and locked them in a room, then set the school afire, according to Kabir Haqmal, a spokesman for the Ministry of Education. It was unclear why the attack had not been previously disclosed. The school has 981 female students and 21 teachers, Mr. Haqmal said. It is in the home district of President Ashraf Ghani, 35 miles from Kabul. In Nangarhar Province, the attack in Momandara was the third time a school in that district had been targeted in the past month, according to Mohammad Asif Shinwari, a spokesman for the provincial education ministry. Attacks on schools by Taliban insurgents were common 10 years ago but proved so unpopular with communities that the insurgents announced that they would not be continued, even claiming to support girls’ education, although few such schools operate in areas dominated by the militants.